So, this is a feature I was very interested in, and after a bit of Googling, I realized it simply wasn't possible to create a legitimate separator. The Start Menu you see is simply a representation of the C:\Users\%username%\AppData\Roaming\Microsoft\Windows\Start Menu folder. So I'll give you a tutorial of how I worked around this limitation. Step 1: You're going to need to create a new folder in your Documents or wherever you can leave it and not delete it or move it. 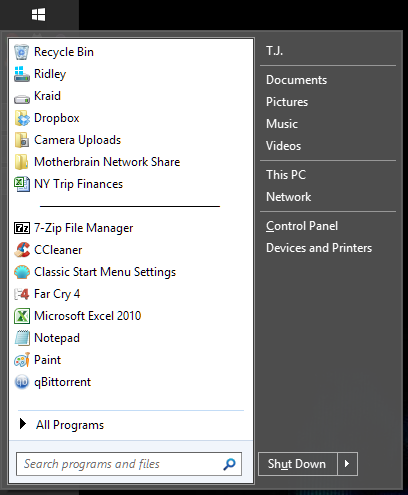 Step 2: Inside that folder, make a new file. Delete the file extension (e.g. ".txt") so it's just a plain file with no extension. Step 3: Rename your blank file to the following, without the quotation marks: " ―――――――――――――――" These characters will appear as one solid line, like you see in my screenshot. I tried using a series of dashes before, but the spaces between them were visible. Be sure to copy the few extra spaces at the beginning, that should keep your separator generally centered. 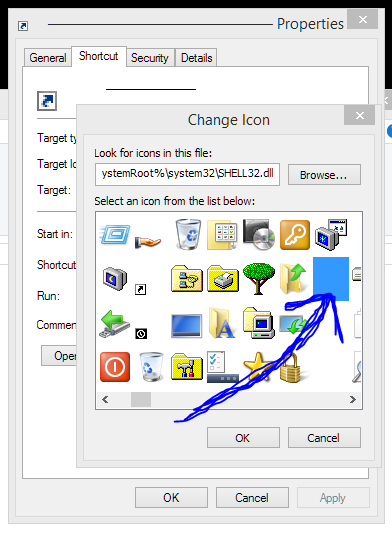 Step 4: Now, you'll need to create a shortcut of that file and move it to C:\Users\%username%\AppData\Roaming\Microsoft\Windows\Start Menu . Be sure to delete the part at the end of the file that says " - Shortcut". Step 5: Right click your new shortcut and click Properties, then choose the Shortcut tab, then click Change Icon... Scroll over and you'll find an icon that's blank. This is the one you want. See screenshot below. Now you should have an empty file that essentially functions as a separator. You'll be able to drag it around your Start Menu to wherever you need it. It's not the most elegant solution, but it works for me. Hope you enjoy. The pinned shortcuts are stored at C:\Users\<user name>\AppData\Roaming\Microsoft\Windows\Start Menu\ or at C:\Users\<user name>\AppData\Roaming\ClassicShell\Pinned\. So creating a shortcut named " ―――――――――――――――" in that folder with a blank icon is your separator/heading. That is a simple but effective idea. If you put text in-between you can also categorize into groups. Looks like the headings that jump lists have. Step 2: Inside that folder, make a new file. Delete the file extension (e.g. ".txt") so it's just a plain file with https://skinnyexpress.com/phen375-review-and-results the Phen375 review and no extension. This is actually very helpful Harry, I've been searching for a way to make my start menu more organized so this is just what I needed. Very helpful for all the work apps I have to use. Last edited by Karrot on Wed Dec 14, 2016 6:16 am, edited 2 times in total. Thanks much, Harry! This is perfect! And your explanation is very clear to this newbie.